All books are available for preview and purchase at BeadedQuill’s Blurb Bookshop. You can also read a brief introduction to each book below. The beautiful cover images are the work of Norfolk-based painter and printmaker, Nicola Slattery. BeadedQuill set herself a creative challenge. For fifty-two weeks, she would share two poems a week on her blog. “My rationale behind the 2×52 project,” explains Evans, “was that if I produced work consistently, some of it would be reasonable and some of it might be dismal. But by the law of the bell curve, a percentage was also bound to be close to good.” Across the year, her 104 poems journal ordinary affairs, imaginative meanders and transcribed dreams. “In the Ocean” is this log of a year of poetry. Once again, the cover art is the work of the generous artist, Nicola Slattery. Emily’s Poems for Modern Boys is Beaded Quill’s second book of selected poems. The Modern Boy, by his own admission, can be rather boorish and in such a bothering rush. Patient and curious Emily has made notes based on her observations of his kind. For his pleasure and edification she presents twenty-five poems offering insights about work, life and on love. Once again, Nicola Slattery‘s lovely work features as the cover image. 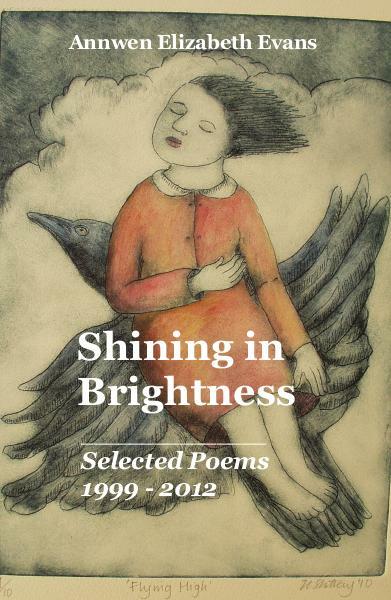 Shining in Brightness courageously takes on the project of reconciling youthful experience. Early poems, such as ‘To whom it may concern,’ echo a creative timidity and self-consciousness. Through the sets, the poet’s voice grows in confidence, inviting us in poems such as ‘Here is something to marvel at’ and ‘Pavement Walker’ to observe the world with her. Nicola Slattery’s wistful illustration of a girl aloft on the wings of a blackbird echoes beautifully the volume’s whimsical tone and the metaphor of creativity as a journey. In the explanatory essay that accompanies the poems, Evans reveals that the other diner is her father. He passed away in 2009 after a battle with colon cancer and it is to his memory that she dedicates the volume. This Blog is very professional!